Get all the perks of a real course right in your backyard or inside your home. Baltimore, MD golf courses are popular amongst locals and tourists alike. With Artificial Greens & Lawns, you can now practice your short game right at home! We are a Celebrity Greens partner, which means we only use professional-grade artificial golf grass. We install professional practice spaces in backyards of all sizes as well as indoor putting greens. Here is what you need to know before we begin a new installation at your home. We use high-quality artificial turf for all our installations throughout Maryland. It is able to withstand heavy traffic and continues to provide a true ball roll time and time again. In backyard applications, it is safe for both pets and kids. Even if they play too rough on the surface, they cannot ruin your practice space. If you want to improve your golf game, make Artificial Greens & Lawns your first call. 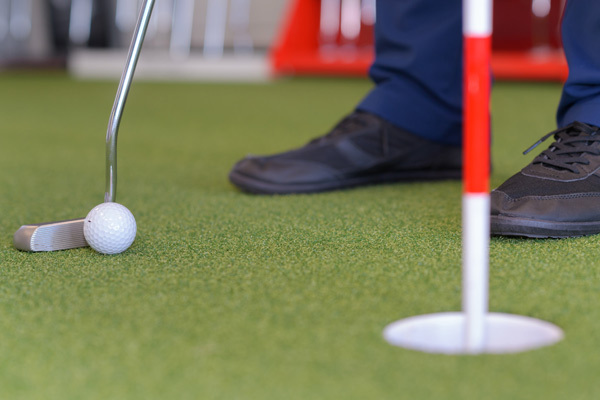 Our artificial putting green turf is the real deal, and we use a variety of synthetic grasses to create a true practice space from the tee line to the fringe. To make it even better, we’re certified by Celebrity Greens to install professional-grade putting greens! It’s time to stop practicing on flimsy patches of fake grass that rip and tear. Upgrade to a mini professional course and get lower scores faster. Artificial Greens & Lawns is different because we come right to your home to give you an accurate price quote and projected completion timeline. Our team is quick, professional, and capable of working with all types of landscape and terrain to complete your project. Once your artificial golf greens have been installed, our team does a quality control check to make sure the finished product meets our standards. Our golf greens installers work with a large variety of requests to create custom practice spaces you will love. After all, our primary goal is to help improve your golf game with a synthetic turf surface. Ask us about custom bunker zones, challenging hills and divots, or tee lines with different pile heights to help with your handicap. Practicing golf at home is now possible for all Baltimore, MD residents. Simply ask a member of the Artificial Greens & Lawns team to come to your home for a free consultation. You can even touch and feel our putting green turf before we install it. Let us help you improve your short game by building a challenging course custom-built to your needs both indoors and outdoors. Schedule your consultation online or by giving us a call: 267-518-3200!